If you're interested in cutting weight and minimizing the size of the seat bag you carry, this is what you're looking for. It's a light tube alright. Out of 10 stars in Overall and Value, I'll take 5 and the tubes can have 5. Why? Maybe I need to watch a video on using tubes or something, so it could be ignorance on my part. I'm not a weight chaser so I have no explanation why I would have bought these, maybe they were on Sale? I found out relatively quickly what a Light MTB tube means when you have a flat on the trail, to be fair the flat was an older regular tube. It means that you must have some patience and finesse when trying to wrench your tire back on. My standard practice ended up putting a hole in the tube, then another hole in the tube after patching, and then after braking my tire tool, walking my bike out of the trail, I got home and put a hole in the second light tube as well. I thought maybe I was not certified in putting on new tubes, grabbed a regular tube from another bike I had and was able to mount the tire without issue. I recommend these tubes if you on the East Coast as you can probably spend the extra time bent over East of Mississippi trying to coax your tire on the wheel for no fear of a Big Cat watching you. Replaced existing tube and got a couple extra for future spares. Was surprised at weight savings but haven't had any issues with flats from too thin light a tube. Tubes aren't too exciting, but when you flat, you'll be happy you have one that you want - light & reliable. Not the lightest tube, but still lighter than going tubless!!! Price is reasonable and tube is really light. There are lighter tubes out there, but they are going to cost you more cash and may not be as durable. I only weigh 170lb so no problems with pinch flats or cuts here. Reliable as they come. Would buy again, would recommend. Bought these tubes because I wanted lighter weight tubes to use with sealant. Many other lightweight tubes (i.e. Performance) don't have removable core valve stems, which you need to get sealant in. These do. They've worked out fine. Weight was just as advertised. 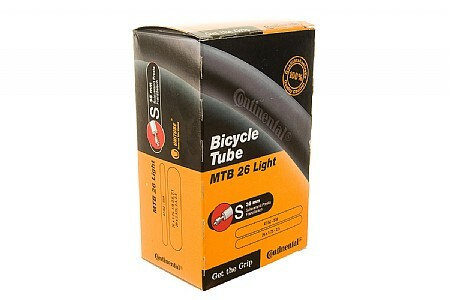 I purchased a set of these tubes for a mountain bike race. The race went well and best of all, no flats! I would definitely buy these tubes again.